Surprising ingredients make up this rich dark chocolate dip. It is full of fiber, phytonutrients, protein, with a perfect balance of healthy fat. If you are unfamiliar with Amla or Lucuma powder, both are powdered fruits. I am extremely fascinated with Amla powder which is Indian Gooseberries. It’s berries so it has to be healthy, right? Right! After reading about Amla powder’s astonishing antioxidant levels, I now add it to every smoothie or dip I make. There are only 3 foods on the planet with more antioxidant levels than cloves, and indian gooseberries are one of them. Lucuma is a Peruvian fruit with a low glycemic index and a maple like taste. It is packed with beta carotene, iron, and zinc. The nutrient density of this dip is raised even higher with the addition of baby spinach. Baby spinach is a secret powerhouse in this recipe!! Shh…no one will ever even know! 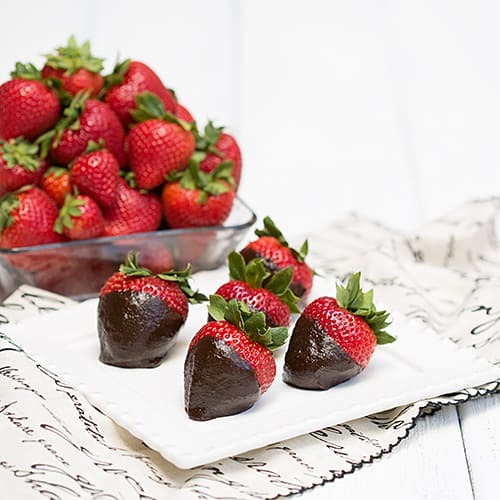 These are Antioxidant Chocolate Dipped Strawberries at their finest! Combine all ingredients in Vitamix or high powered blender and blend until smooth! Store in refrigerator after blending.